“Picasso: Guitars 1912-1914,” currently on view at the Museum of Modern Art, is a bridge into the past. Walk into the exhibition and be immersed in Picasso’s creative process. Here, Picasso is thinking and working like an inventor. I’ve always been most drawn to Picasso when he approached his work through his extraordinary skill and originality as a draughtsman. During this period, I see him thinking and drawing his way through a new kind of space and his relationship to it, making it his own. 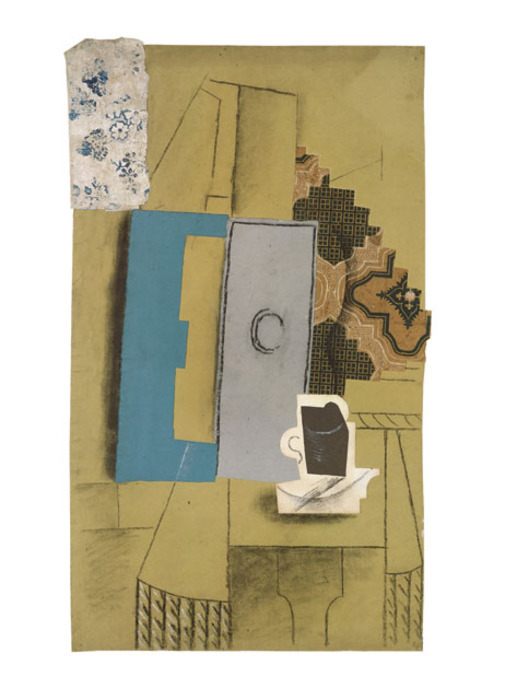 The fluidity of his collage-drawings with their variety of shapes, lines, materials and subject matter, tells me that Picasso was having a very good time. Guillaume Apolinaire sums it up best in “Modern Painting,” from Der Sturm on February 20, 1913: At times Picasso has renounced ordinary paints to compose relief pictures made of cardboard, or papiers collé’s; he was guided by a plastic inspiration, and these strange, coarse, and mismatched materials were ennobled because the artist endowed them with his own delicate and strong personality. Gelatin silver print, 3 ⅜ “ x 4 ½ “ (Private Collection). The exhibition should be a special treat to all working artists who consider experimentation and exploration in our studios to be highly important in making the best art that we can. Picasso does it with gusto and freedom, unafraid of the new territory he is staking out. I enjoyed seeing all the work but what I especially relished were the photographs that Picasso took of his works-in-progress. 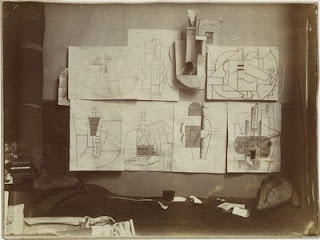 In one large photograph of his studio, paper scraps and glue pot are left sitting on a bed as he takes the photo. There is also a huge roll of canvas leaning against the back wall, three charcoal drawings, four collage drawings incorporating Le Journal scraps, and other papers and his constructed cardboard guitar. This photo shows he was looking for many different ways to spatially represent the guitar that he had just constructed out of paper. He was trying to make his process as real as possible and photographing his work helped him distance himself from what he was creating. Photography was integral to Picasso’s process. He used photography as a tool to gain perspective and as a way to manipulate his images. In the exhibition there are four small photographs of a composition that Picasso set up in the corner of a room—a sort of installation. In the first snapshot, he set up a small round-topped table with a wine bottle and teacup. A wall poster with large letters partially revealing his name hangs on the wall near some stretched canvases. On the back wall hang a guitar, collage drawing and paper scraps partially covering it, integrating the real and the constructed. In each of the four photos, Picasso alters the picture. 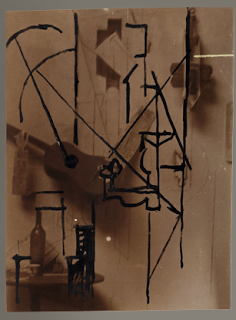 Pablo Picasso, Photographic composition with Construction with Guitar Player and Violin. Paris, on or after January 25 and before March 10, 1913. Cropped gelatin silver print with ink, 3 1/16 x 2 5/16" Private collection. Photo: Objectif 31 © 2011 Estate of Pablo Picasso/Artists Rights Society (ARS), New York. Two of the four images are very surprising and if you aren’t paying close attention, you might miss their significance. In one, Picasso uses his photograph of the still-life he set up and cuts it into a shape and re-photographs it on a white background. 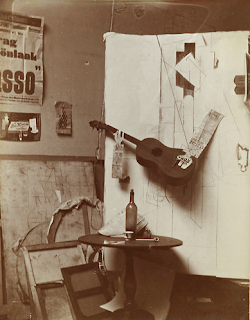 There is also a small sepia-colored snapshot [above], tiny at 3 1/16” x 2 5/16,” and titled “Photographic Composition with Construction with Guitar Player and Violin.” Again, it is the still-life composition that he has been working with, only this time Picasso uses ink to make a drawing on top of the photo that responds to the composition he has created in real life. It may seem like a minor thing, but to me it shows that Picasso was trying in every way he could imagine, to expand his sense of what this new space could be. Though it would be decades before it became common practice to draw or paint on top of a photograph, here is Picasso, determinedly stretching his creative possibilities almost one hundred years ago. When I consider all that Picasso accomplished in his lifetime—the tremendous breadth of his undertakings—I feel dizzy, like I’m standing on shifting ground. When I viewed this exhibition, it prompted me to pause and imagine him sailing through time clutching a fine, silver-meshed net in his fist, combing the starry sky. This exhibition shines a spotlight on Picasso’s innate abilities, intelligence, and the exceptional creative spirit that propelled art forward into a new and expanded universe. Kyle Gallup is an artist who works in collage and watercolor. Another wonderful contribution, Kyle. That next-to-last sentence is both memorable and inspiring, the kind of sentence I wish I had written.